It seems that time has caught up with me, and it’s now my turn to host the monthly Carnival of Aces here at Neutrois Nonsense. First off, “a blog carnival is an event in which many people write blog posts around a single theme.” You can read more about this particular carnival (and its history) at Sciatrix’s Masterpost, which includes previous and future hosting sites and some handy dandy FAQs. As the host, I get to pick a theme (or at least I think I do, in which case I did, so deal). Several were in my list, but I picked one in particular that stands out because of its continual discussion, dissection, and dispersion in the Asexual community. That’s the theme. Relationships. Everyone grapples with relationships, but asexuals seem keen on talking about it, a lot. So what more could be said? A lot more. If you’ve hit a lightbulb moment, stop reading and go write. Otherwise, continue below for possible ideas. I’ve already written about my very special Asexual/Sexual relationship before, and several other aces have shared their stories as well. But this is still the topic that ranked most salient in my mind from reading other blogs, discussions, articles, and forums on Asexuality. Romantic aces sometimes worry about finding a partner who will respect their identity, who will not push them to do anything they don’t want, who will not take it personally when they want to move extra slow, who will see them for who they are. Aromantics could be concerned with navigating different degrees and types of relationships, often mulling over those different degrees and types. They might be pioneering new relationship models and, when everyone else thinks they should have a partner, they live a happy, fulfilled life without a partner. Kinks and poly aces, of which there are plenty, are also testing unfamiliar waters, living a happy, fulfilled life with many partners, when everyone else thinks they should have just ONE partner. And then, once that brilliant Ace can somewhat make sense of it themselves, how do they explain all this to someone who just doesn’t “get” it? There are many kinds of relationships, from monogamous to non-monogamous partners; to friends to best friends to more-than-just-friends; roommates, classmates, cellmates, lifemates; parents, grandparents, children, neighbors, teachers, higher powers; yourself. Aces come in all kinds of yummy and exotic flavors, and their relationships are just as unique. So, asexual snowflakes of all kinds (and non-asexuals very welcome too), come together and share your story. I’m making it real easy here, so no excuses. Leave a comment at the bottom of the post with your name and link to your piece. Email me maddox.xander©gmail.com with a link to your piece and your info. If you’d like me to host a guest submission for you (ie, you don’t have a blog of your own), email it as well. If you’d like to be Anonymous, let me know too. Nothing written before July 1st will be accepted. Otherwise I’d be the first to cheat on this. I want you to approach this topic from a new perspective, even if you’ve thought about it before; especially if you’ve thought about it before. Anything after August 1st will still be accepted. If you’re just seeing this now, you still have a chance. I’ll keep updating the roundup post as submissions come in. Anyone is welcome to submit, but the content must cover Relationships and Asexuality in some way. This is very loose and vague so there’s no way you can miss the mark on this one. Any form of submission is accepted. This means: WordPress, Tumblr, Blogspot, LiveJournal/Dreamwidth/whatever kind of blog. It can be short or long, deep or shallow, just stick to the theme, preferably in English but other languages are welcome. I’ll also accept submissions in comic form, or photography or painting or other mediums of artistic expression. Since we’re talking about relationships I’ll let you put in some mushy-squishy stuff (that is poems for the rest of you), or even a song (bonus points for actually singing it). If you’d like to submit a video entry you can do that too. One-act plays are also game (two-act as well, but now you’re stretching it). 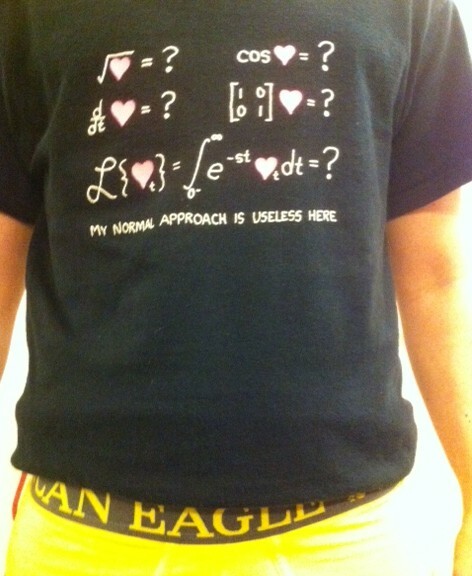 And of course, mathematical equations are equally valid. 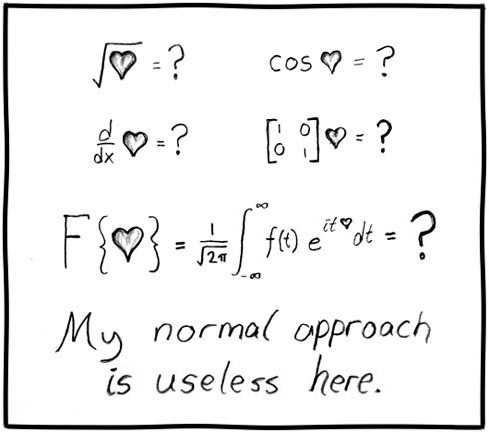 I leave you with my favorite comic / mathematical equation (I called dibs first). Of course I have the shirt! Oh drat, well there goes my original plan of writing in Swedish with a little bit of Swahili thrown in. In all seriousness though, I think I’ll try to do this one. It’s an important topic that a surprising number of people, of all (a)sexual orientations, need to understand more and come to terms with. Plus I haven’t written about this as extensively as I would have liked to. Expect one from me…eventually…if my finals don’t kill me first! By the way, just as a note–yeah, of course you get to pick the topic as the host! Frankly, I find the idea of trying to come up with a new topic every month pretty exhausting. I’d much rather enjoy what the people who host the carnival come up with. @Meike: Don’t worry about finals, do this instead. Come on, this is a good excuse to start thinking and writing, and you have a deadline! Plus, we can all practice our Swedish. @Sciatrix: Wasn’t sure if I could pick the topic, I had several in mind but in the end I chose the most talked about. And I chose it specifically because people (you among them 😉 ) talk about it a lot. But this month, I challenge you to approach it from a fresh perspective, dig deep and find something new that you haven’t realized before. @Elizabeth: Of course it doesn’t have to be about romantic relationships, that’s the whole point! Whatever relationship you want to write about is valid – it can be about your most meaningful, or your least meaningful relationship, the relationship with your parents, or your dog for that matter. Whatever inspires you. I finally wrote something for this blog carnival! Yay!! I ended up writing about how we assume desire for touch is a necessary component of close relationships. I think I’m going to submit this. Although I might end up submitting a second entry if I can work one out this weekend. I wrote a whole long post about how I build relationships, and then I remembered that this is an ace carnival. Most of us already know (and probably do) the things I wrote. So I wrote this instead. My collaboration to the carnival. On the suggestion of aceeccentric, I edited up a post I rather coincidentally made to tumblr about relationships and communication and all that lovely stuff so that it would make more sense. This is my submission. I hope it’s adequate. I’m squeaking in just under the wire here with my description of being in a queerplatonic life partnership. Yay for finally getting around to writing something for one of these carnivals! Squeaking in on the last day and hoping that this fits in with the theme of what you’re looking for.